Shirley Grey’s best friend, Trisha Morris, has an accident and ends up in a coma because she defied orders and warnings in practising her diving at a dangerous cove, which tempted fate once too often. Although she was acting on Trisha’s instructions, Shirley blames herself because she had covered up about Trisha’s whereabouts to Mrs Morris. Mrs Morris also blames Shirley for the same reason (she does not know Shirley was only obeying Trisha) and lashes out at her whenever their paths cross. Shirley twice insults the boss’s wife by giving a too-honest opinion on her clothes (hideous and don’t fit her properly because she’s too fat). As a result, Shirley’s father loses his promotion and his job is on the line, and Shirley’s parents are up in arms against her. Mum is having hysterics because they needed money from the promotion to buy a place away from the estate, which has been terrible ever since a gang of troublemakers moved in. Shirley begs a nurse to go against the Morris parents’ instructions (no visitors for Trisha except immediate family) and let her see Trisha. When Shirley is caught and the matron demands to know if the nurse let Shirley in, she says the nurse did. The nurse throws Shirley out, raging at how Shirley has repaid her – by getting her into trouble. Shirley falls foul of the school bully Evie Moore when she tells on Evie for stealing from a teacher because she can’t lie. Evie ruins Shirley’s blazer and demands menaces money of £1 a day, which Shirley can’t possibly pay, of course. When Shirley fails on her first payment Evie and her gang threaten to do something terrible to her. Shirley’s friends find their courage and rise up against the bullies, but Evie gets hurt. When the teacher asks Shirley who did it, Shirley says who it was without explaining why. Furious at how Shirley got them into trouble when they were trying to help her, the girls have everyone at school send her to Coventry. Even the teachers feel the effects of this. Evie’s final revenge against Shirley is to frame her for shoplifting. Shirley is convicted and the court is awaiting a social worker’s report before passing sentence. All the while everyone is trying to tell Shirley she is being ridiculous, both in the way she is blaming herself and in thinking she can go through life without telling a lie because everyone has to one way or other. “You’ve got to pack it in,” says Shirley’s friend Hannah. “You can’t go through life without telling a lie – it’s not possible!” Even Evie tells Shirley she is mad about never lying, and around the district Shirley is soon derogatorily dubbed the girl who never tells lies. But Shirley says she can’t help not lying and won’t stop blaming herself. As things get progressively worse, Shirley comes to think it is all a punishment for Trisha’s accident. She fails to realise the trouble all stems from her blaming herself. The final straw comes when Shirley overhears Mum having yet more hysterics that she can’t take any more of this and is going to have a nervous breakdown. Mum has been having nothing but these hysterics ever since Dad has lost his promotion. But when the false shoplifting charge came up Mum has been extremely selfish about it. Although she and Dad believe Shirley innocent, neither of them show her any sympathy, support or concern about it and treat her harshly. All Mum can think of is the shame of it all, that she’ll be struck on this dreadful estate, what everyone will think and how she won’t be able to hold her head up, etc, etc. At any rate, Mum’s hysterics have Shirley decide that the only answer is to run away, which she does blindly. Shirley’s disappearance has the parents finally showing concern about her and they call the police. Shirley finds herself back at the cove where it all started and the very cliff edge where the accident occurred. This gets very dangerous for Shirley when she falls asleep there and then the parents and police shine a blinding light in her eyes. She falls off the cliff, nearly drowns in the sea below, and takes a head injury that fractures her skull. She is rushed to hospital, and when Mum hears that it was her hysterics that made Shirley run off, she realises how selfish she has been. Shirley finds herself in the next bed to Trisha, and still blaming herself for Trisha’s accident. The medical staff suggest Shirley talk to Trisha about their times together in the hope this will bring Trisha out of the coma. But Mrs Morris, who still blames Shirley for the accident, won’t allow Shirley near Trisha. However the same nurse from before helps Shirley to talk to Trisha secretly, and forgives what happened last time. After two weeks this brings Trisha out of the coma. Shirley finally stops blaming herself and the grateful Mrs. Morris apologises for her conduct. Shirley discontinues her vow never to tell even a white lie because she now understands “that things aren’t all black-and-white”. But there is still the little matter of the problems Shirley created for herself with that guilt complex, and there is now a wrongful conviction hanging over her head as well. What about those? Shirley finds most of these problems are now sorting themselves out, albeit in a somewhat contrived manner. Shirley’s remarks shocked the boss’s wife into slimming and a complete makeover. She is so grateful to Shirley that Dad gets his promotion after all. There is new hope that Shirley will be cleared of the shoplifting once the social worker get the courts to reconsider Shirley’s side of things because she was going to such extremes about not lying. What Shirley started about standing up to Evie has continued, despite her “dropping [the girls] in it”. As a result, Evie has lost her power as a bully and is no longer her “cocky, obnoxious self”. However, the girls have not forgiven Shirley. Trisha and the more forgiving Hannah try to persuade them, but they remain unmoved until they see Shirley covering up for them and telling the teacher the Coventry thing was just a misunderstanding that’s been sorted out. They go along with it and are reconciled with Shirley. 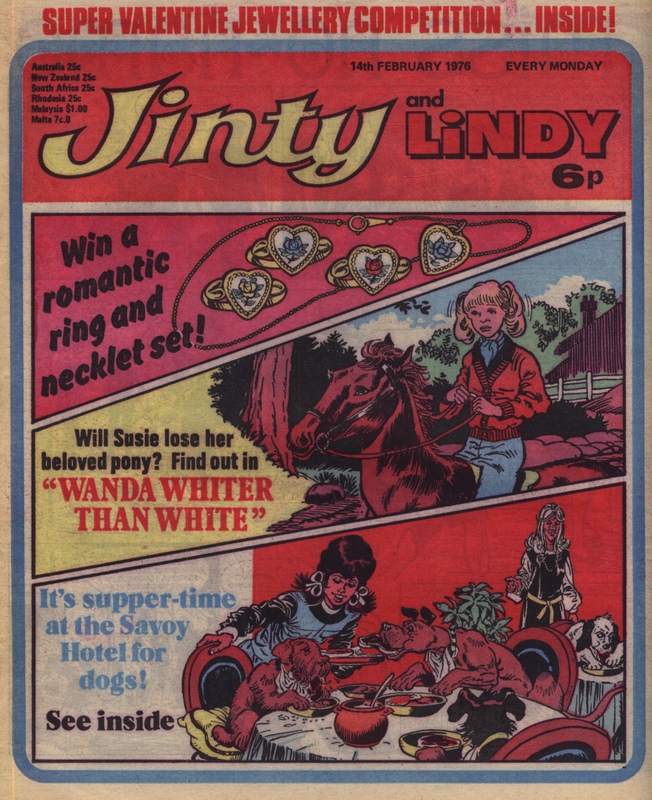 Essentially, Shirley has the same problem as Wanda White in Jinty’s Wanda Whiter Than White—she is taking truth-telling to extremes that causes problems both for her and for everyone around her, and it all stems from a huge guilt complex. In the end, Shirley, like Wanda, realises things aren’t all black and white and uses a white lie to help redeem herself. Unlike Wanda though, Shirley knows she is hurting people with all this extreme truth telling and feels terrible about it. But to her mind she can’t help it and she’s got to tell the truth at all times. Again unlike Wanda, Shirley is a totally sympathetic character. She is tortured by guilt, keeps getting herself and others into constant trouble over her extreme truth-telling, becomes a victim of vicious bullying, a frame-up that gets her wrongly convicted, and nearly gets herself killed. Like so many protagonists in girls’ comics who are suffering from a massive guilt complex, Shirley is blaming herself over something that is utterly ridiculous. If anyone is to blame, it is Trisha herself. That’s what everyone tells her, but they’re not getting through. This girl needs serious counselling and psychiatric help. But despite initial concerns about how badly Shirley has reacted to the accident and some talk of getting a doctor involved to help sort Shirley out, her parents never do so. Instead they degenerate into the common theme of parents handling things badly in girls’ serials. This is because they’re thinking too much about how the effects of it all are having on themselves. They’re not thinking about Shirley at all until her disappearance shocks them out of their selfishness. The story also makes a serious statement about bullying and harassment, and ineptness in handling it effectively. It’s not just the vicious bullies at school that Shirley falls foul of. There is also a gang of delinquent girls who have been causing nothing but trouble ever since they moved in and turned a once-great estate into a nightmare for everyone. For example, they set fire to a lady’s washing. But nobody seems to do anything about them and by they end of the story they go unpunished. That’s pretty much how Evie Moore went too with her bullying until Shirley’s extreme truth-telling got her reported for the very first time. However, unlike Evie, they don’t add much to the story. The only time they really do so is when they chase Shirley while she is running off because she shoved one of them over. But she is too fast for them – hurrah! For the most part though, they are just distracting. Perhaps their purpose in the plot is to explain why Mrs Grey is so desperate to get away from the estate and keeps having hysterics that she’s going to be stuck there once Dad loses his chance of promotion. Evie gets some punishment in that she loses her power and her bullying days are over at that school. But it feels she got off too lightly considering what she’s done, particularly to Shirley. She is not even expelled for stealing from the teacher. The headmaster just gives her a final warning and will expel her next time. “He’s too soft,” says one girl. “He should’ve expelled her now!” We certainly agree, and we feel the story is making a comment about schools not cracking down on bullying hard enough. One of the artists mentioned in the recent talk about girls comics was Ana Rodriguez. David Roach has a set of portfolio samples used to showcase her drawing abilities (see below) which credits her as such. Initially I had little luck in finding any internet trace of her but eventually I found an entry for her on Spain’s comic artist database, Tebeosfera, as Anita Rodriguez Ruiz . This also links to an entry on Lambiek’s Comiclopedia. 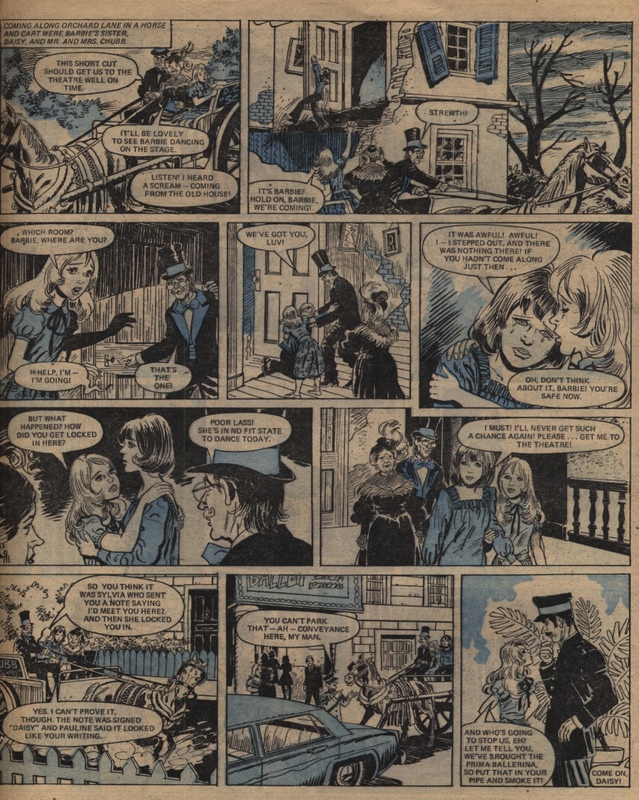 She also drew a large number of stories in DC Thomson titles such as Debbie, Judy, Tracy. See the Girls Comics of Yesterday site for posts tagged with her name. Her particular focus is clearly on girls comics, though there is little solid information on the Tebeosfera and Comiclopedia sites about other work done by her. Here are some pages from “Blind Ballerina”, where Ana Rodriguez’s showcasing of the girl protagonist’s faces is very evident. I have some slightly random issues out at present which I dug out for other reasons but which haven’t yet been posted about, so I am seizing the day. This run of Jinty is slightly middle-of-the-range: the fact that the covers have images from a variety of stories gives a diverse feel to them, but the square design layouts used are rather lifeless in comparison with the issues just a bit later on. Likewise, there are some good stories in this issue, but it is not as strong as subsequent issues, by a long chalk. “Miss No-Name” has an amnesiac slave gymnast – nuff said, really. It is rather a mish-mash of tropes! Jim Baikie makes the slave-keepers look suitably evil but it is all rather over the top, and not in that good way. “Friends of the Forest” is beautifully drawn, though not outstanding in terms of story – at this point there is a mystery around the gypsy girl Maya, and some evil cousins to deal with. “Fran of the Floods”, as in other issues, shines out as the strongest story – no wonder it ran for such a long time. This episode has the rain keeping on coming down, and life changing around everyone’s heads, even in staid suburban England. Fran is facing local flooding, stockpiling of food, and serious danger from the neighbours. “Too Old To Cry!” is a story I have a soft spot for, perhaps due to the lovely Trini Tinturé artwork. Nell is trying to find her birth certificate, which she is sure has been hidden by Miss Grace, but inadvertently sets the place on fire! “Wanda Whiter Than White” is also over the top, god love it. 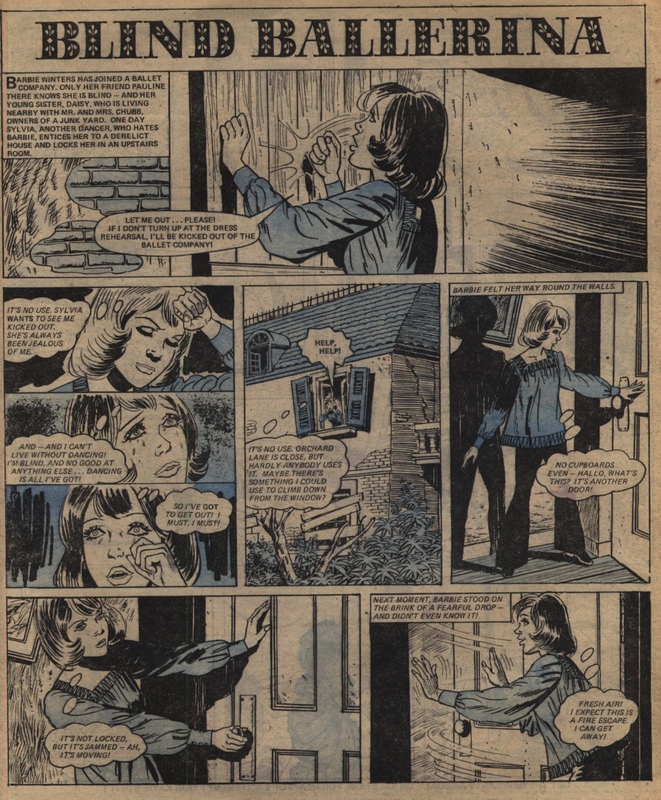 Wanda is high and mighty and dishing out black marks, and by twisting the situation nearly gets protagonist Susie expelled from the school (the punishment is commuted to a caning instead!). Luckily for Susie, the good relationship between her and her mother is strong enough to stand up to Wanda’s interfering ways when she tries to make trouble – though who knows what she will do in the next episode. In “Bound for Botany Bay”, Betsy Tanner is almost looking forward to transportation to Australia, as it may mean she will see her father again. In the meantime she has been drawing portraits while she is in prison awaiting transportation – but will she be able to escape before she is tried? This is the first episode of “Save Old Smokey!”. Drawn by Phil Townsend, it is mostly interesting to me nowadays for the social change it shows: the story is about a steam engine threatened with closure by local officials who are either heartless bureaucrats or out to make some money for themselves. This is the last episode of “Golden Dolly, Death Dust”, so it is fitting that it should have a final appearance on the cover too. 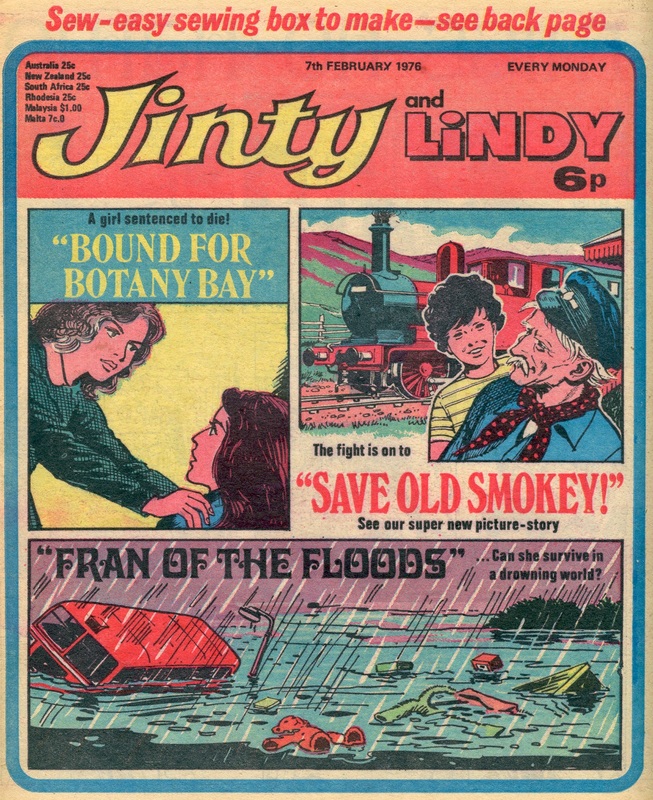 Next issue Phil Gascoine starts his new story, and the longest he ever drew for Jinty – “Fran of the Floods”. 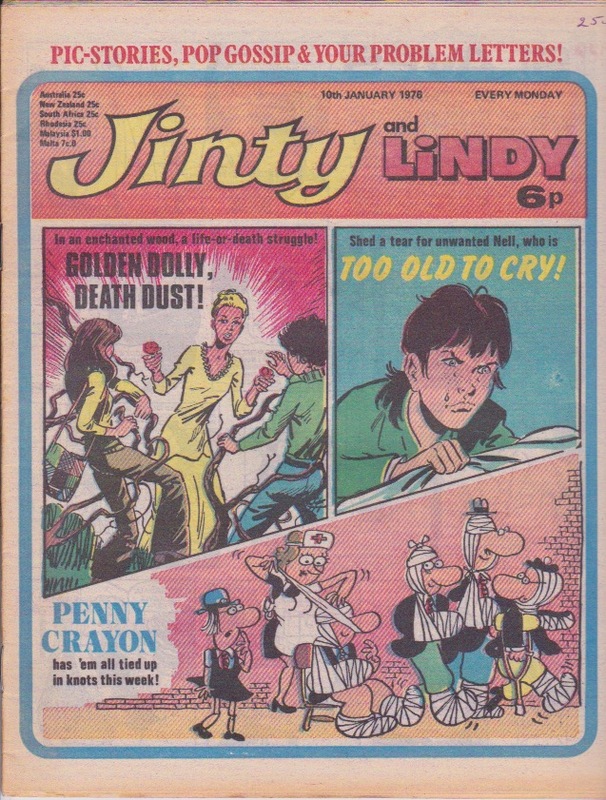 And although Nell’s story says she’s “Too Old to Cry”, the cover definitely shows her crying in this episode. I have always felt the title of this story was a bad one. Couldn’t they have chosen something more descriptive? Elsewhere, Ping-Pong Paula has achieved her latest victory. But Mum spoils it with her pride and turns away because she was obliged to share Paula’s victory photograph for the paper with her estranged husband. We are told that it’s the climax for this story next week. Oh good – it’s about time those quarrelling parents were sorted out. “Slaves of the Candle” is also approaching its climax, with Mrs Tallow threatening to burn down the House of Candles – with all Lyndy’s friends in it – if Lyndy tries to stop her stealing the Crown Jewels. At this, the long-fighting Lyndy finally gives in. But the blurb for next week tells us fate has a surprise in store. The artist has also changed for this story; Roy Newby has been replaced by a filler artist, whose name is not known. But Newby will be back to draw the story that replaces this one – “Bound for Botany Bay“. In “Friends of the Forest” a new friend, Maya, emerges to help Sally against the nasty Walkers who treat her like a slave and want to sell her beloved deer to a circus. But it turns out that Maya is on the run, which is sure to cause even more problems. Wanda, the biggest tattletale in the school, makes herself even more unpopular, and poor Sue cops some of the blame as well. And now Wanda’s been appointed a prefect, which means it’s bound to get worse. And it starts with Wanda accusing Sue of stealing! Hazel’s beginning to understand why she’s being haunted, and she is defying orders to go home so she can investigate some more. And it looks like she’s going to get some help from Marnie, the old woman of the mountain. And in “Song of the Fir Tree”, Solveig and Per have escaped Grendelsen’s latest attempt to kill them. Unfortunately their father thinks Grendelsen succeeded and is giving up the search for his children and heading home. This issue has a filled-in (but not cut-out and sent) version of the form you were supposed to send in with your letters. It gives the reader’s name as Lillian Coates, age 12, living in Leytonstone. Her favourite stories were “Wanda, Whiter than White”, “Fran of the Floods”, and “Save Old Smokey”. In “Miss No-Name”, the wicked Ma Crabb cuts Lori’s hair so that no-one will recognize her as the missing young athlete: meaning that the Crabbs can keep her as their unwilling wee slave. This sort of petty humilation is not untypical of a slave story, of course. In “Fran of the Floods”, Fran has not yet started out on her voyage to find her sister; things are getting progressively more and more savage near to home, as climate change is making more of an impact locally as well as globally.